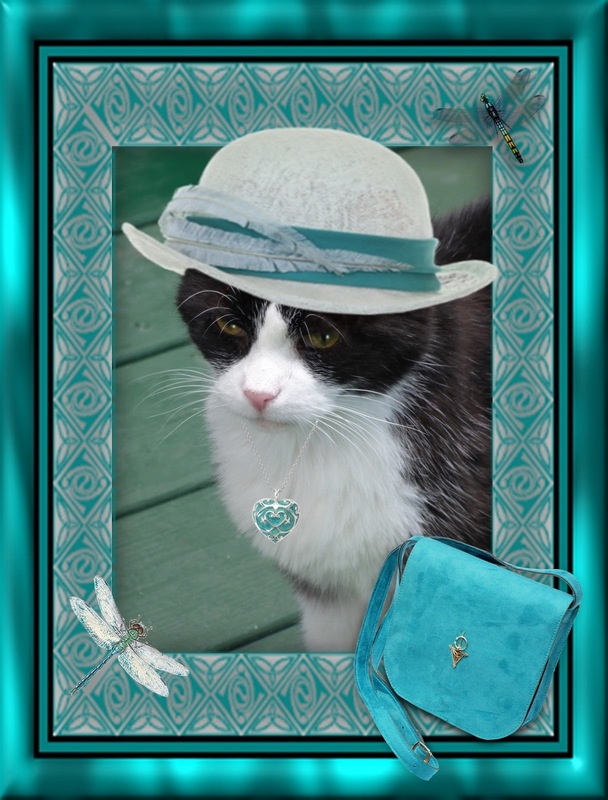 Here's Domino in June 2015 all bedecked in teal and white. Her hat is a modified bowler with slightly upturned brim, woven in white with a teal band and a gossamer feather wrapping around it. The feather is reminiscent of the dragonfly's wings. The sterling necklace with teal heart pendant (encased in silver filigree) is a purrfect counterpoint to her headpiece; once again being both deliCAT and whimsical -- something like Domino herself. Domino's purrse is a simple yet classic design in teal leather with shoulder strap and tiny gold embellishment. "Dragonflies is reely mice, but yoo kin get carried away wif dem if yoor not careful" warns Domino.